When we left home a week ago there was a blanket of snow on the ground, with more snow in the forecast. It was cold and calm. When we landed in Bangkok almost 24 hours later it was quiet the opposite–hot and hectic. Within a few minutes I couldn’t even remember what cold felt like. Or calm, for that matter. 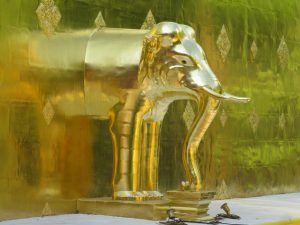 Shiny elephant, Chaing Mai, Thailand. Thailand is vivid, a sensual smorgasbord. We don’t feel culture shock, exactly–we’ve been here before and knew what to expect. But the sensory overload takes some getting used to. And, I have to say, it seems to be taking us longer to make these adjustments than it used to. I destroyed a few taste buds on a curry dish the first night–painful but delicious. We both have aches and sore spots from encounters with enthusiastic masseuses. Our energy levels are still crashing in the afternoons, and we find ourselves wide awake at odd hours of the night. But all that will pass, sooner or later. Thailand has been remarkably stable and peaceful for several decades, but in recent years there have been political conflicts and confrontations between a couple of factions, violent at times, mostly in Bangkok. The King had been sick for many years and there was speculation that his death would bring increased instability. But so far, so good. A one-year period of mourning has been declared, which may be keeping a lid on things. The King was a beloved figure, and I think the Thais truly do want to show respect for him and his legacy. Unfortunately his son, who will take the throne, is not nearly as popular. This time next year may be a whole other situation. We spent four days in Bangkok, mostly to give ourselves time to adjust before moving on. I like Bangkok, and it is well worth whatever time one can give to it. Bangkok is a lot of things, and pretty much at the top of the scale when it comes to sensory stimulus. But the thing that stands out for me is the commerce. It is everywhere, from the crap vendors on the street selling trinkets that are probably barely worth the raw materials they are made of, to multi-national corporations in gleaming high-rises. And everything in between. From my admittedly shallow perspective, there is an overall sense of abundance and industry. We didn’t feel like doing the typical sight-seeing thing in Bangkok, but we did make a pilgrimage to an air-conditioned monument to excessive wealth. In the heart of the city there is a cluster of several multi-story shopping malls, each with a different target audience. Since we couldn’t really afford anything in any of them we spent some time looking around the most high-end one, called the Siam Paragon. That is where you can find the best, most luxurious of everything. On the third floor there are several exotic car showrooms, with makes such a Maserati, Ferrari, Rolls-Royce, McLaren, Aston Martin, Lamborghini and more, some boasting price tags of close to a half-million dollars. Gawking was free. One of the buildings nearby catered to a younger, but equally affluent crowd. There was a shop specializing high-end Japanese denim, popular with hipsters, with jeans selling for $350. For those who couldn’t afford to be quite that fashionable, there were shrink-to-fit, stiff-as-a-board Levi’s, the kind I used to buy for $12 a pair as a kid, selling for $250. Hipsters ruin everything. It turned out to be a good thing we planned to spend four days in Bangkok. It took that long for our luggage to show up. That is two trips in a row that has happened. I don’t want to point fingers, but the common denominator in both cases was Air Canada on the first leg of the trip. Maybe having your luggage arrive at your destination on the same plane you are on is an option you can choose for additional expense. Leaving Bangkok we took a sleeper train to the northern city of Chiang Mai. We quite like Chiang Mai, but the main reason we are here this time is so I can get some dental work done. Thailand in general is a popular place for “dental tourism”, and Chiang Mai has several places known to travellers and expats. I’ve had work done at the clinic I am going to before and, as far as I can tell, their work is fine. Compared to what I would have to pay back home, I’m saving enough to pay for our entire trip. After we leave Chiang Mai, we’ll be getting off the beaten path more, into new territory. We’re looking forward to that.